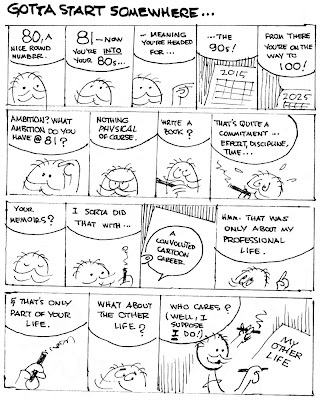 Educational strips used to occupy a pretty sizeable niche in the newspaper world. In fact, for the McClure Syndicate one of them, Highlights of History, may well have been their biggest seller in the 20s and 30s. McClure didn't have nearly as much success with this strip, Outline of Science. The numbered strip tried to tell the history of science in imitation of J. Carroll Mansfield's Highlights of History. Max Hahn, who otherwise has no comic strip credits that I know of, supplied the text and pictures. Hahn's mistake with the strip was in not telling a story. His strips read like something out of a middle school textbook, a dry rundown of facts and figures without any drama to make the history come alive. Whereas Mansfield's strip sought to entertain as well as educate, Hahn's strip sounded like a series of lectures. The highest numbered strip I've been able to find is #249 and I doubt that it ran much longer than that. Based on strip numbering in my samples I place the start of the strip at October 18 1926.
hcollectibles out of Oregon has two strips listed on his site. One for $10 & one for $20. The comic strip is from a series called "Sambo and his Funny Noises". I'm trying to put together a sales package for my proposed Stripper's Guide book. My proposal will include a small excerpt from the Stripper's Guide listings. I was thinking of submitting either the 'Q' or 'Z' listings, but in reviewing them I find several slightly embarrassing missing pieces of data. Can anyone supply answers to any of these? 1. When did the Ze Gen'ral topper to Little Joe end? I have samples as late as 1961, but for all I know it might have lasted until the end of the main strip in 1972. Anyone have any from later than 1961? For that matter, does anyone know the specific end date for Little Joe itself? 2. Does anyone have definite running dates for Zenon, Girl of the 21st Century? Best I can come up with is sometime in 1998 through December 1999. 3. Yow, does anyone have a specific start date for the newspaper strip version of Zippy the Pinhead? I know it started sometime in 1985 in the San Francisco Examiner, perhaps a little earlier than its King Features syndication. This one is really annoying because I have all the Zippy books and can't find the info. 4. Does anyone know a paper that ran the historical series Quaint Old New England? The reprint book tells me that it ran 1935-36 but I need to check it in a newspaper. I found this one-shot comic strip in the Philadelphia Record of January 16, 1916. Wondering if it might be Forrest's first pro cartooning work. Forrest did a few more one-shots in the Record over the next few weeks and then disappeared from their pages. Of course, Forrest went on to do Tailspin Tommy. Madison, Wis. — Ruling on a question brought by the trustees of the estate of Carl T. Anderson, creator of the comic strip character "Henry," Judge G. M. Krincke held that life tenants named in the estate will receive all the income accruing from the strip, along with present in­come not yet disbursed. His two sisters, who are the life tenants, will not be required to share the income with other heirs named in the will. On the basis of the decision, the sisters of the late cartoonist would receive $28,780 which has already accrued from the strip and future profits. The decision said the comic strip was valued at $164,566 for taxation by the Wisconsin Department of Tax­ation. Mr. Anderson, who was un­married, left the bulk of his es­tate now valued at approximate­ly $451,605, to his sisters and provided a $40,000 fund for the education of his nieces. Future heirs of the sisters will receive the rest of the comic strip in­come if there is any at that time, Judge Krincke ruled. The persons who are now drawing the "Henry" strip are under contract. If the name "Tallulah" is con­tinued as the title of a comic strip a suit will be brought by actress Tallulah Bankhead, her attorney told E&P this week. Donald Seawell of the firm of Silver & Bernstein, New York, said a suit Miss Bankhead brought against Procter & Gam­ble relating to the use of the name "Tallulah" in Prell Sham­poo advertising, is pending trial next month. In the suit, Miss Bankhead contends the name "Tallulah" suggests "Tallulah Bankhead" to the public. Mr. Seawell stated the same stand would be taken in the case of a comic strip. He said a letter of protest had been writ­ten to National Newspaper Service, Chicago, which launched the "Tallulah" strip last month; but that no papers have been filed so far. President John F. Dille of NNS, contacted by E&P, said the new strip "has nothing to do with Tallulah Bankhead." He declined further comment. The gag-a-day strip is drawn by Ira Yarbrough, who signs his work, "Yar." Thanks very much for that. Talk about finding a needle in a haystack there! Okay, so now we've got a month, and confirmation that the strip started in the Examiner before it was syndicated. Can anyone' come up with a syndication date? I checked the archive.org page for "Zenon" from TMS website and it seems the last strip (at least to appear on the website) was December 5, 1999. That looks to be a very useful site, but I had no success in duplicating your results. Could you give us a quick lesson in how to use the website? Look at the March 11, 2000 page and look at the latest date. From an entertainment standpoint, the 1950s were the decade of the western. With a TV in every living room and broadcasters scrambling to fill airtime, the old 'B' western movies of the 1930s and 40s became a television staple. The public proved receptive to the genre so the networks also began to produce new television 'oaters' in massive quantities. Newspaper comic strips, always a medium that embraces the latest fad, gave editors a vast array of new western comic strips to pick from, apparently under the assumption that what people watch on television they want on the comics page, too. The wisdom of the assumption was questionable, and most of the western comic strips had limited success. Gene Autry, the singing cowboy, was first put into comic strip form in 1940 as Gene Autry Rides. That strip fell flat, but evidently Autry felt it was time for another try in the booming 1950s cowboy market. The new strip, titled simply Gene Autry, was syndicated through General Features starting on September 8 1952. Though a Bob Stevens was credited as writer I'm told that it was actually Phil Evans, with oversight by Albert Law Stoffel. The art was credited to Bert Laws, who, I am also told, is actually Pete Alvarado with an assist from Tom Cooke. Whether the strip was any good I'll leave up to fans of the genre (personally I've always found westerns to be real snoozers). Good or not, it was undeniably handicapped by having General Features marketing it. General Features was a small syndicate with no sales force, and with the plethora of other western strips of the 50s being sold by travelling salesmen for the big syndicates it didn't stand much of a chance. The early returns on the strip must have been half-way decent because a Sunday was added on April 26 1953. But that limited success was evidently short-lived because the strip ended on November 5 1955, a little over three years into the run. Between the lack of sales horsepower and the flooding of the western strip market it was a foregone conclusion that the singing cowboy would have to ride into the sunset. If newspaper strips embraced all fads... was there ever a psychology strip? You bet, Ger. How about "Doctor Katz", 1996-99. 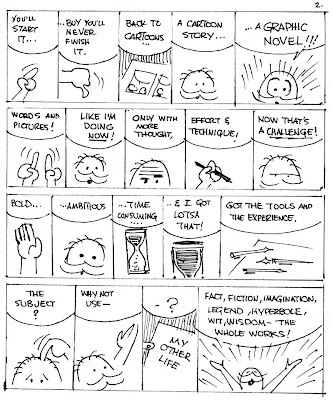 And the panel cartoon and column series "Let's Explore Your Mind". Also, Alberto Becattini writes me privately with more info on Gene Autry's creators. He says that the art was initially done by Pete Alvarado in 1952, and that Mel Keefer took over in 1954-55. He says the Sundays shown on the blog are the work of Tom Massey. wasn't Albert Law Stoffel the packager of the strip, rather than an artist? or at least that's the way I recall him. I see he's credited with writing the Bugs Bunny strip for 15+ years... did he do that? or just package the strip? You're right, Stoffel would be the writer. The confusion comes in with the apparently entirely pseudonymous credits. Stevens and Laws both don't exist as such is my understanding, and for some reason or other I assigned Stevens as the writer and Laws as the artist. But I guess that should be the other way around. The non-existent Laws should be credited as writer, and the non-existent Stevens should be credited as artist. Ah, what a tangled web we weave! I think you mention Hy Rosen in your book as a third artist later on in the strip. I have seen some of those and feel they are a touch above the others. Could you expand on that sometime? The British Board of Trade's decision to ban the import of comic supplements of American and other foreign newspapers is expected to stop the bulk in­flux of U. S. Sunday papers having such supplements after March 31. The British ban, originally scheduled to take effect March 8, was later stayed until March 31. John Block & Co., freight for­warders of bulk shipments of Sunday copies of the New York Daily News, the New York Daily Mirror and the Chicago Tribune, had orders to continue shipments that would arrive be­fore the March 31 deadline. But Block officials expected the business to cease after that date. The Mirror observed editorially: "As nearly as we can tell, this new decree will keep out of Britain all but one or two American Sunday papers, which hardly, by themselves, offer a fully rounded picture of our American thought and life." Circulation Manager William Denhart of the Daily News in­dicated no plans were being made to ship the papers minus the comics. Observers familiar with the British situation thought the British distributors who receive the American newspapers would not be eager to distrib­ute them minus comic supple­ments. The papers forwarded in bulk are at least five days old by the time they arrive. While circulation figures were not available, it was understood that one New York paper regu­larly ships as many as 7,000 Sunday copies. The Newark (N. J.) Star Ledger had been shipping about 3,000 copies of Sunday over­issues to Britain per week up until two months ago. This dis­posal of over-issues, which could not be counted on circu­lation, was discontinued be­cause it did not pay off, officials said. The British move, aimed pri­marily at U. S. supplements but covering other foreign countries as well, was designed primarily to save dollars and not to "clamp down on the world flow of news," a Board official told E&P's London cor­respondent. A survey made by the Board for the 12 months ending in June, 1949, showed that about $520,000 worth of newspapers with comic supplements was imported from the U. S., and that of this amount about $400,000 worth was imported in order that the comic supple­ments might be sold separately. "It won't mean a big loss for the U. S. newspapers, but it was a frightful waste for a country short of dollars," the Board official said. U. S. syndicate officials, not directly affected by the ban, were nevertheless aware of a British situation involving the "bootlegging of comics" that had grown up as a result of an earlier British ban on Ameri­can comic books. The ban on importation of American comic books was placed soon after the war start­ed, according to one syndicate official. The selling of comic supplements separately, and at prices higher than the whole newspaper would ordinarily sell for, has filled the comic books gap, it was pointed out. Some syndicate salesmen be­lieve the ban on importation of American comic supplements may be a wedge for selling more American strips to Brit­ish newspapers. A columnist in the Evening Standard, London, remarked rather archly: "Our own recol­lections of the comics were not such as to make it seem likely that it could be the subject of an international smuggling traf­fic." He said that "once inside the country these (American) newspapers were discarded, but the supplements retained and sold for vast sums." General manager Cranston Williams of the American News­paper Publishers Association has protested the British ban on importation of supplements to Secretary of State Dean Acheson. "At the present time when there is every effort to encourage the free flow of com­munications between nations it is difficult to reconcile the ac­tion taken by the British Board of Trade," he wrote. "Granted that comics do not represent news, still they do depict phases of American life which would lead to a greater understanding between nations and peoples." The Daily News editorially suggested: "U. S. reprisals for this stab at a small bit of our foreign trade would be easy to take. We think they'd better be taken, too, lest the British Socialists be encouraged to ex­tend this dirty little boycott principle to other and larger items." The Philadelphia North American was the most receptive paper in the country to female cartoonists. Why that is I dunno, but here's another distaff cartoonist by the name of Inez Tribit (nee Townsend). Inez had two known series, a decade apart. The first was Gretchen Gratz for the Inquirer which lasted a year. Her second, Snooks and Snicks, was more successful, running from February 23 1913 until the North American's homegrown comics section ended on July 4 1915. According to one online bio Tribit moved to California in the 1900s, but they also claim she did Gretchen Gratz for the Philadelphia Tribune, a paper that would have had little interest in strips about cherubic white children since it was published to serve the Philadelphia black community. Take with a grain of salt. Snooks and Snicks were another in the endless procession of Katzie clones, their claim to originality being that they wore (for no obvious reason) clothes associated with the Dutch. The strips were done in rhyme which was slightly better than the typical doggerel usually found on the comics pages. 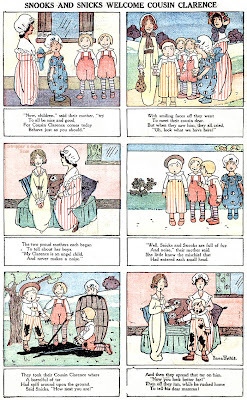 Tribit's art style was pleasant, done in a style often seen in children's books of the day. Our sample today marks a minor change of focus for the series as the newly introduced Clarence went on to pretty much take over the strip. Welcome to a new Sunday feature of the Stripper's Guide blog, a project by Jim Ivey called "My Other Life". He produced these pages over the past year or so to include with his voluminous correspondence. They're done in a wonderfully simple off-the-cuff minimalist style -- practically boiling down a story into a series of icons. Fledgling cartoonists take note at how few lines are necessary to get the ideas across - less is more! The great cartoonist Phil May was once castigated by an editor for using so few lines in his drawings - the editor felt he was being shortchanged. May's response was that if he could use any fewer lines he would have to charge more. Most of the pages tell anecdotes from Jim's (non-professional) life, others are philosophical, but all are delightful, interesting and good reads. I asked Jim if I could share them with you folks on the blog, and he very graciously agreed after making a few minor edits and changes for general public consumption. I'll be running this original series on Sundays until I run out of material. Most episodes are single pages, but this introductory episode is a special double pager. Enjoy! I first met Jim Ivey in the mid 70's. We spent MANY hours talking, playing cards, and hanging out. It's great that you're posting Jim's strips. I hope it inspires him to do more!